Thinking about getting yourself a new dog? Looking for an active companion? Well, I’ll have to say that the German Shepherd Husky mix should be on your list of breeds to check out! 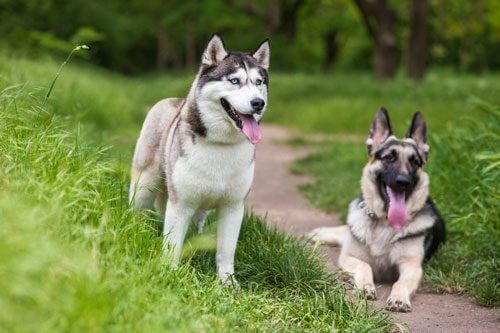 The good looks of the Siberian Husky meet the temperaments and traits of the beloved German Shepherd in this dog breed and the pups are known to be loyal, alert, friendly, loving, and make for excellent guard dogs. In this blog post, I aim to share with you several facts about the adorable German Shepherd Husky Mix. So, keep reading to learn more! It’s All In the Genes: All about the Beloved German Shepherd and Husky Parents! The Gerberian Shepsky is a hybrid dog and hence, isn’t formally recognized by the American Kennel Club. 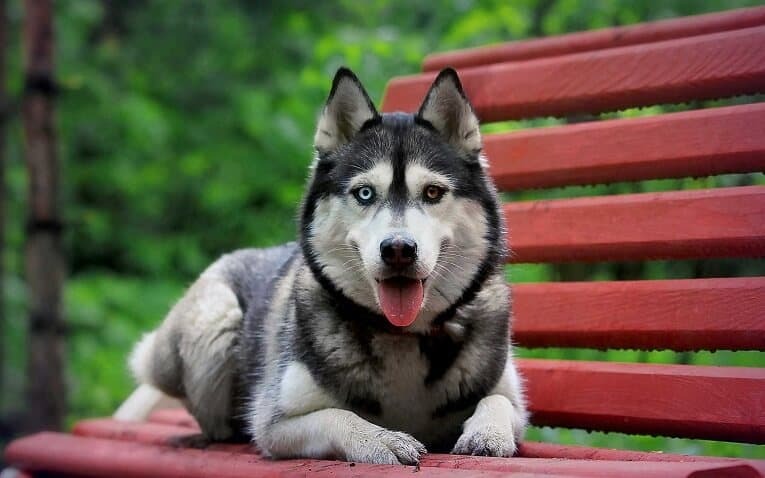 Also sometimes called the Siberian Husky German Shepherd, this dog breed is officially recognized by the American Canine Hybrid Club and also by the Dog Registry of America. Lets quickly talk about the Gerberian Shepsky’s parentage. The thing with mixed breed dogs is that it is hard to predict how a puppy will turn out to be and which of the parents it would take after more. There’s no predictable pattern as the dominant genes take time to play out. The German Shepherd or the GSD is a herding dog that was bred in the 19th century. 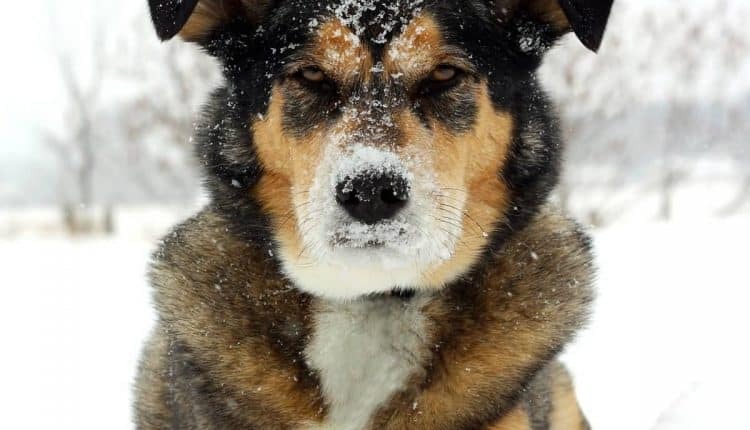 The dog was created to be an intelligent, smart, strong, and quick companion but rapid industrialization during those times decreased the demand for herding dogs and the industry experienced a set back. Breeders then decided to get the German Shepherd a job in the police and military where these dogs assisted humans as their messenger dogs, guard dogs, sentries, pack carries, and more during the Great War! This dog breed quickly gained popularity and found its way to the United States of America! German Shepherds in this day and age are known to be hardworking, extremely smart, energetic, and loyal companions. The dog is typically reserved and doesn’t really mix with new people quickly but isn’t overly aggressive either. This dog is known to be affectionate and loving and protective of his loved ones and family. The harsh and tough climates of the Siberian Arctic are home to the Siberian Husky as it is his place of origin. And this is largely why the German Shepherd Husky Mix doesn’t do very well in warmer climates. The Siberian Huskies were bred to help humans out by pulling heavy weights on sleds and cover vast distances – which required them to have endurance as well as strength. These dogs gained popularity in the US and Canada and were officially recognized by the American Kennel Club in the 1930s. In this day and age, the Siberian Husky is known to be a pack animal who does well with families. These dogs do not do well at all when left alone and are known to get destructive if they aren’t given the right mental and physical outlet. This friendly, charming and loyal dog needs a firm handling. The offspring of the two parents are the Siberian Husky German Shepherd mix. The breed is a powerhouse of energy, agility, and high stamina, a championed dog with a strong work ethic and a guardian of their loved ones. Do keep in mind, this active dog needs room and ample time to play. Keeping this breed tucked away in an apartment for long hours is highly advised against. Keep reading below for more specifics on the breed! If Looks Could Kill: The Cuteness Scale! The German Shepherd Husky Mix is medium to large in size and the average height of the fully grown adult dog is between 20 – 25 inches and the average weight falls between 45 – 88 pounds. However, one thing that I want you to keep in mind is that with the mixed breed or designer dogs, it can be hard to predict which parent they’ll take after—especially if they’re a first generation mix (a puppy that has one German Shepherd parent and one Siberian Husky parent). So, take everything I tell you in this blog post with a grain of salt. The average lifespan of a German Shepherd Husky Mix is 13 years but they are known to live up to 18 years if they lead a healthy lifestyle. As for the coat, the German Shepherd Husky Mix has a double coat that may either be long or short and has a fluffy appearance—just like that of the Huskies. The sole purpose of the double coat is to provide protection from the cold environment. 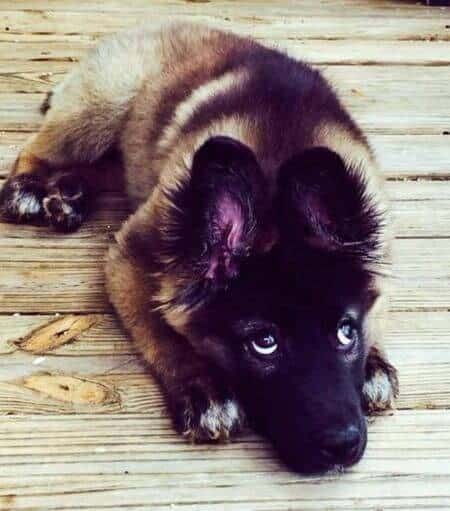 The thing is that the German Shepherd Husky Mix is known to have dual-colored eyes which may resemble either the GSD or the Husky. It is generally a gamble. This dog is known to be a moderate shedder and sheds the most during seasonal change. This dog also requires regular grooming so it is advisable that you brush your dog regularly and grind his nails. You can look at some of the best dog brushes for Huskies here and find the right one for your German Shepherd Husky Mix. Other Health Concerns Eye problems, dwarfism, joint dysplasia, digestive issues allergies, and eczema. The German Shepherd Husky Mix is the product of mixing two active dogs known to be full of energy. So, obviously, the German Shepherd Husky Mix has high activity needs! These dogs required to be walked a minimum of once a day but, generally, walking them twice is better. These dogs love to play games such as fetch, tug of way, frisbee, etc. and love to take out all of their energy! German Shepherd Husky Mix owners recommend agility training and maybe a mental workout of some other kind to keep the doggy busy. These dogs do best when they’re living in a house that has enough space for the doggy to run around freely and thus, do not do well in smaller spaces such as an apartment. One thing that a potential German Shepherd Husky Mix owner should know is that exercise is extremely important for these dogs. These dogs are full of energy and you need to find a healthy channel for all this energy or else the dogs start indulging in destructive behavior. This is exactly why you should train your doggy well. 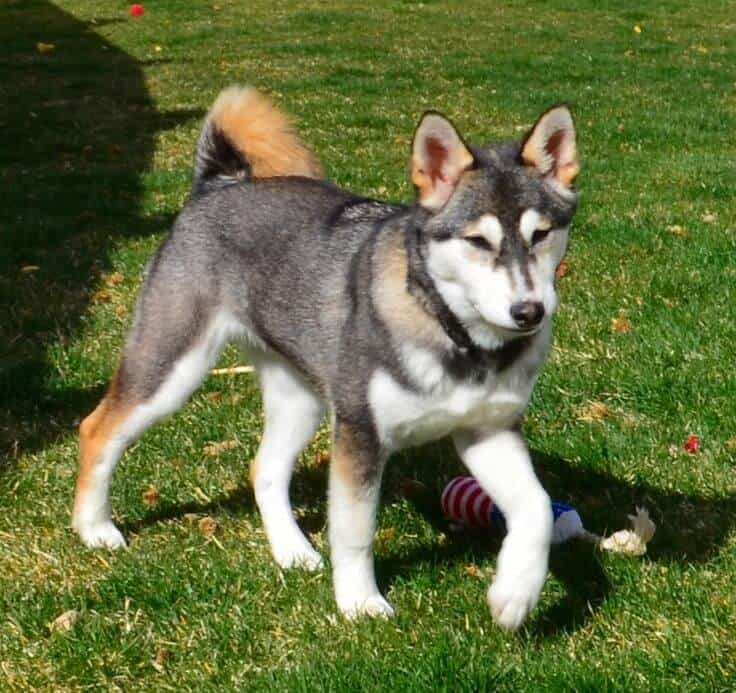 As I mentioned earlier, the German Shepherd Husky Mix is an active dog and needs just the right balance of nutrients to accommodate all that activity. Usually, it is the puppies that require higher nutrition and as the dog grows older, the lesser calories his body demands. 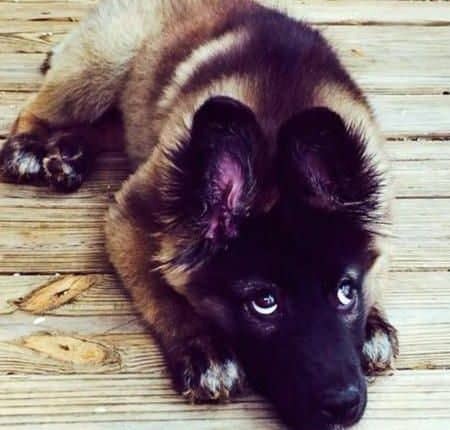 The German Shepherd Husky Mix is known to have a healthy appetite and it is recommended that you test a few different dog food brands before committing to one so that you can find a brand your dog just loves. Ideally, I would recommend you choose any dog food curated for the parent breeds or for the large breed dogs. You may also check out my list of the best dog food for German Shepherds for more details. The one things that you need to look out for when selecting dog foods are the macronutrients. These dogs generally prefer canned foods over the normal kibble as they’re easy to chew and digest. There’s one thing you need to keep in mind, though. You should always consult the vet before you make any adjustments to your German Shepherd Husky Mix’s diet as they can help you determine whether or not the change is beneficial at all. The Gerberian Shepskys are a mix of working dogs as well as herding dogs. So, it is safe to say that these dogs are built to be active but, also need to be around people or other dogs in order to be satisfied with their lives. They generally don’t take isolation very well. They also have high exercise requirements! It is generally true that when these dogs don’t get a positive outlet, they channel their energy into destructive behaviors such digging, excessive barking, chewing on household items, etc. One of the most common complaints about the Gerberian Shepskys is that they are barkers. This makes them not-so-popular with the neighbors. Even though barking shouldn’t really be counted as a problem, it is something that you can easily tackle by obedience training. You should ideally begin when your puppy is still young. I’ve written a blog post that’ll help you train your puppy without facing any hurdles. You can read it here. The German Shepherd Husky Mix is known to be chewer and to have a powerful jaw which, if not channeled correctly, could mean the demise of your furniture. I recommend that you use some good-quality chew toys that last long. My top picks include Pet Qwerks Bark Bone for Aggressive Chewers, Ropeez Dog Chew Rope Toy. 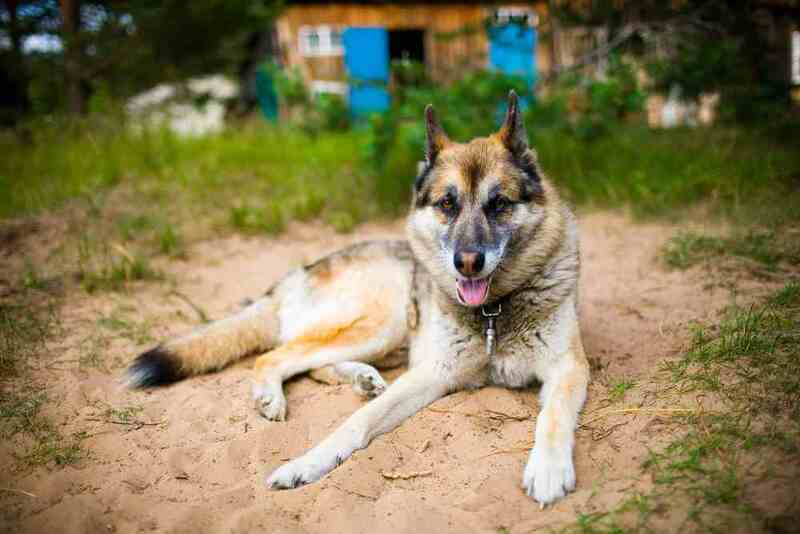 The Personality Matters: What are the Temperamental Traits of the German Shepherd Husky Mix? The German Shepherd Husky Mix is known to be calm and gentle but, the dog’s look makes him look bold and muscular and a dog to be feared. These dogs make a great pet and a working companion for humans. The dogs are as loyal as they come and will never disappoint you. They’ll always put you before themselves. These dogs have higher cognitive abilities as compared to some other breeds and catch onto things rather quickly, making them easy to train for difficult tasks. They make for excellent guard dogs—a trait inherited from both of their parents. However, they’re known to be excessive barkers. These dogs mix well with people and are friendly and trusting when they get to know someone (and aren’t threatened by them). These dogs do well with families and mix well with children and other pets. These fur-balls are full of energy and need regular exercise and at least one walk per day—or else they indulge in negative behaviors such as barking, chewing, mouthing, etc. These dogs are really loving and affectionate and will demand to be pet all day long! It is common knowledge that due to the genetic variation, crossbreeds are healthier than purebred dogs. After all, that’s how evolution works, right? Easily preventable, this condition leads to unstable or loose joints in dogs. This is mainly caused due to obesity and can be controlled is you keep your dog’s weight in check so that the joints aren’t stressed. Juvenile cataracts: The onset occurs when the dog is older than 6 years of age. These cataracts involve the opacity of the lens of the dog’s eyes can even result in blindness if they are severe enough. Corneal dystrophy: This condition leads to the accumulation of certain abnormal materials in the dog’s cornea (the outer layer of the eye) and causes some sort of visual impairment. This condition is acute and develops over a course to time and ultimately causes visual impairment by affecting both eyes. 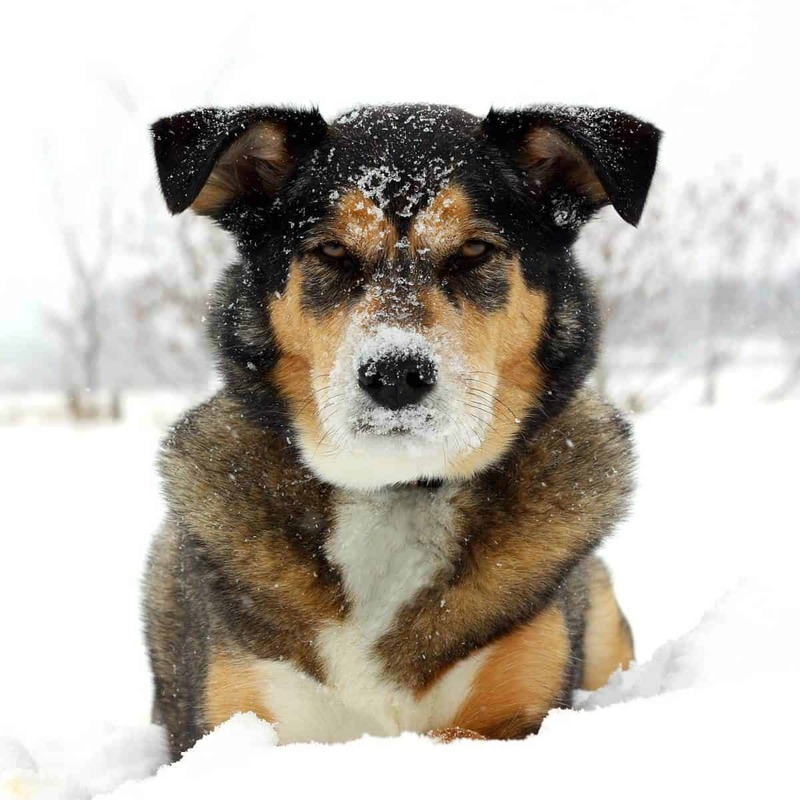 Progressive retinal atrophy: This condition occurs in the dog’s twilight years and the symptoms include dilated pupils, night blindness, inability to see in bright light, etc. The hereditary condition is incurable but early diagnosis can assist in protecting your dog’s vision. There are some other uncommon issues that the German Shepherd Husky Mix faces. These include eye problems, dwarfism, joint dysplasia, digestive issues allergies, and eczema. The German Shepherd Husky Mix is a sweet, fun loving, charming dog known to be extremely loyal and intelligent. A product of the two most popular breeds, this dog proves to be a great companion and service dogs for individuals and families. This dog isn’t for those who live in small apartments, can’t take their dog out for at least one walk per day, or are not home for the majority of the day. 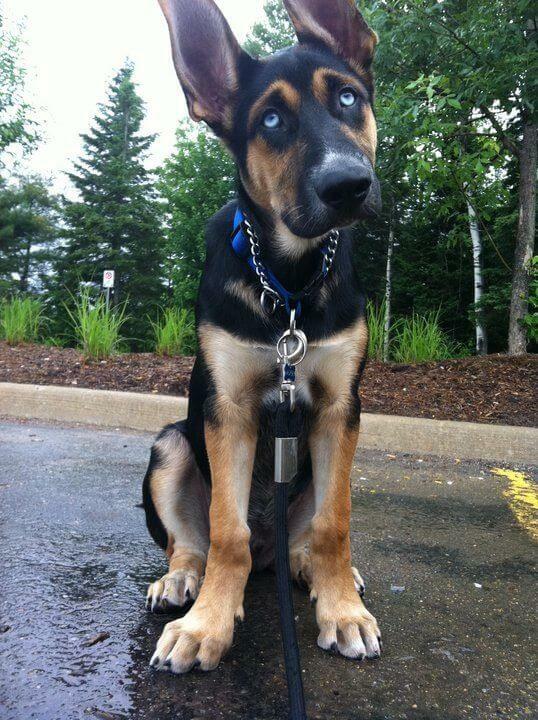 What are your thoughts on the German Shepherd Husky Mix? Tell us in the comment section. My son and I found a female husky mix(shepherd) at the local pet shelter almost nine years ago on Christmas Eve Day. A beautiful tri-color, looked a lot like the canines in the pictures above. Someone had set her over the fence of the play yard at shelter one night or early morning before anyone was there. Never could figure why. Shelter thought they did it to avoid surrender fee. Whoever missed out on a wonderful friend but we didn’t! Since the shelter had no records of her the vets could only guess her age which they figured somewhere between 3-4 years old when we met her. Sadly I recently had to put her down do to some health issues. I could have kept her going a little while longer but didn’t want her to suffer for my own selfish reasons, she didn’t deserve it. She, Niki was the best dog I have ever been around let alone had in my life. Beautiful with a wonderful smile. So happy to be with whoever. Everyone made over her and commented what a nice dog. Niki liked to lay around and took all the loving, hugs and kisses we gave her. Very patience and gentle. Hardly ever barked. Never growled or showed her teeth at or to anyone. Not one mean bone in her body. Receptive to everyone, little kids hugging her around the neck to strangers petting her wherever. People who didn’t know her thought she was still a puppy up till recently cause of how well she aged and her size. She was on the small size for this breed, 50 pounds. When we went for walks she was not interested in other dogs although many of them barked to get her attention. We miss her terribly and she’ll forever be in our hearts. We’re so thankful for the time (8 years, 8 months)we had with her. Just a beautiful kind loving friend GOD placed in our lives and us in hers.